You have a chance to win some AMAZING blog candy! It's valued at well over $1000!!! I’m excited to offer this wonderful May Arts ribbon to you. May Arts is definitely one of my favorite companies for ribbon because they offer so many excellent selections, it is hard to choose just a few. You’ll find a nice assortment ranging from velvet to satin to polka dots (we have to have our polka dots!). 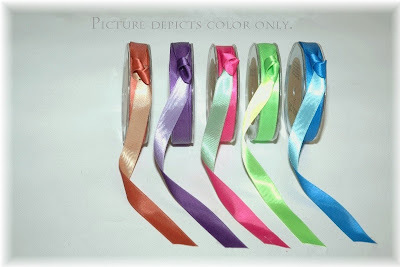 The details of each specific ribbon share are listed below the picture of each ribbon style. I’ve included pictures to show the colors included in each share, NOT THE QUANTITY. The details for yardage included in each share are explained below. 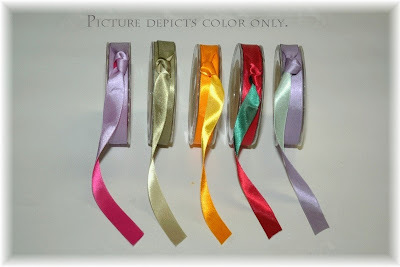 I am happy to order full rolls of any May Arts ribbon for you. Contact me and I can get you the pricing. Details for ordering are at the bottom of this post. US shipping is $4.80 for Priority mail regardless of the quantity ordered. Insurance is optional and included at buyer's cost. Please let me know if you would like insurance. Canadian & International customers: please contact me for shipping quote. I accept Paypal (preferred) and personal check. Paypal is fast and it's free to use! Personal checks must clear bank before items are sent. I will be ordering the product once payment is received from share participants. I reserve the right to make substitutions in the event of backorder or other situation. I will keep you updated here on my blog. :) Please subscribe to my blog so that you are kept up to date. Shipping time may vary depending on the manufacturer's shipping schedule. Once product reaches me, I will do my best to send them on to you in a timely fashion. Thank you for participating! If you're ready, please send me an email to stamperchick@hotmail.com so that I may get your name on the share list. Please do not send payment until I have responded to your email. Ahh...life...you know how it goes. It flies by and before you know it, it's been a long time since you posted anything on your blog! I've been quite busy the last few weeks working on getting things ready for MOPS this year. I'm excited for it to start...it's going to be fun! Along the way we left our camera at a friends house, so I haven't been able to take pictures of my latest cards and creations. Thankfully, we've got it back...just haven't gotten around to taking pictures yet. This past week I caught a sinus/head cold which hasn't been fun. But thankfully I don't think it's really bad and I seem to be getting better already. At least the stuffiness isn't as bad. I do have some fun in store for you! I'm putting together the final details of a May Arts Ribbon Share!!! I've picked out some very fun ribbons...thanks in part to everyone's fabulous input from a couple months ago :) Be on the lookout for it in a few days. I'd post it now, but I won't be in town for a couple days and I'd like to be able to respond to any questions, etc. I hope you're as excited about it as me! Hope everyone has a spectacular weekend!